While fishing with Hook’n Them Up fishing charters your day will be spent on a 27ft SEA RAY with 225 horse power outboard motor a true west coast fishing machine and for those of you who knew the boat Raini II we bid a fond farewell thanks for all the good times and memories that we all shared (Raini II was my first boat that I retired). 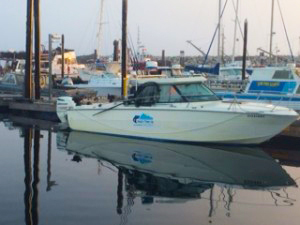 The vessel is fully equipped with the latest safety gear and quality fishing equipment to suite your halibut and salmon fishing needs. For your safety and ours The Captain is fully Transport Canada Certified with SOVP, ROC MC, Marine First Aid, MED A1,A2,A3, CPR C & AED. We exceed and excel on the amount of SAFETY that we provide when fishing with Hook’n Them Up Fishing Charters.